This Is The Most Life-Like Tree Face I’ve Ever Seen! Today I stray ever so slightly from the homebuilding topic — although it relates to a post I wrote about tree faces some time ago. That particular article has been a fairly popular post over a long period of time for a number of different reasons. Tree faces make great year-round landscape decorations and folks like to go crazy with them in some very creative ways around the Halloween season, too. Well… I happened to see something this past weekend that you just don’t see every day. Remember all of those tree faces that I wrote about earlier? They were all inanimate objects that liven up your landscape with life-like features, right? 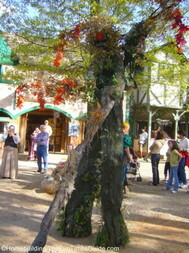 When we attended the Georgia Renaissance Festival in south Atlanta this past weekend, there was nothing inanimate about the tree face that we saw upon exiting the festival grounds after a great day of fun! 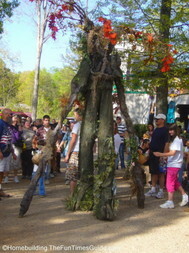 A Life Size, Realistic Tree Face! Simply stating that it’s a tree face isn’t giving the wearer of this enormous costume enough credit. 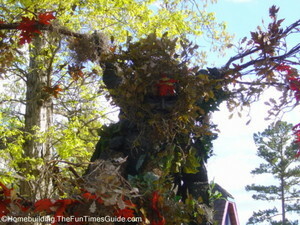 It was a full-blown, living tree costume — and it was probably about 10-12 feet tall. An awesome spectacle, very life-like, and a great costume, to say the least. 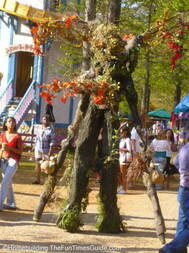 It was a very gentle, slow moving tree that just sort of sauntered around the entry/exit area of the festival grounds (…as you might expect it to move if it could). The wearer is obviously skilled in stilt-walking. This is the tree costume to beat all tree costumes, but even a smaller version of this would make a great costume idea for Halloween. 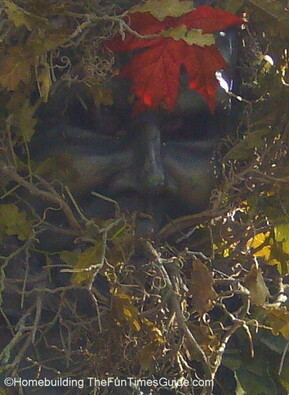 Need more information on Halloween and tree faces?